If ever I needed an incentive to get up and run, you guys have given it to me this month, the marathon means a lot to me and its great to see so many of you taking on the distance, finishing it with smiles, and proudly wearing your medals, I loved the image of Luke crossing the line at Paris, in he’s Spiderman bandana, which then became a white band on he’s forehead, it was also a warm day for Michael Belton who successfully completed he’s 3rd Marathon in Brighton. Both Jamie Neil and Kevin Stevens achieved Bronze standards and big pb’s at Manchester, so pleased for Kevin after years of suffering with cramp in the latter stages, this time he paced it right and smashed it, proving if you try, try again and you will succeed. I’m delighted for you both, along with Andy Fuller who paced Lesley round for her standard, so smiles all round in Manchester. Let’s spare a thought also for Charlie, Martin, Scott, and Dave Goldsmith who all had to pull out of Marathon’s with injury. I hope next year will be their turn to smile. On to London and David Wright smashes a pb, plus a silver Standard, very closely followed by Michael Simmons in he’s 2nd London knocking 3 min’s off last year’s time and nailing a Gold Standard bang on at 3:08. Well done to Gary Hill, Graham Miller and some bloke called Shawn (more about him later) for completing the distance and may I say, what a nice looking medal for a change to go with it, and finally a technical tee! I may even be tempted back next year now! John Bush has been all over the place this month, Bungay half, Harlow 10k, nice pb, Sudbury 5, where he was joined by Phil (matching pb) Presland, , Luke Groves (PB) Lee Clarkson the returning Martin Owen, Michael Belton and Ade Cherry whom both claimed a Bronze standard, while smiling through the streets of Sudbury. At the Gauntlet our team of Ben Ficken, Paul Carlisle, and Graham Semple munched their way through mud and obstacles to come 3rd in the team event. And in Park Run, from Chelmsford to Florida, both Matt Knowles and Paul Hollidge claimed a bronze standard, Congratulations to you all on your achievements this month. We began the month with the wonderful bunny doubles, a huge thank you to Des and Theresa for hosting what has become a great family event, Chocolate, Cakes, more chocolate, a few more cakes, and then a few Cheshire cat grins from Russ and we all leave happy and content for another year. The running is pretty good too, with the men taking most of the chocolate prizes on offer, and the children had their own races and prizes thanks to the Easter Bunny. The Micky Edwards series began, with many of you gaining new pb’s, congratulations to Luke (PB) for just beating Rita to the line in the 1st handicap, to take the Race leader T-shirt with Frank Gardiner not far behind in 3rd, Clive Thomas secured the fastest Runner T for he’s time of 18:20, and Ade to he’s surprise and delight gained a Silver standard, with Barry Jarvis also nailing a Bronze standard. Personally for me the real winners are those of you that have offered, and assisted me to organise and marshal this event so far, providing support to our runners on the course and looking after everyone’s welfare has meant so much to me. I would also like to welcome two new members this month, Derek Grantham whom is a keen off – road runner, and Andy Stevens who likes to run long with a few marathons already under he’s belt. The new social team have arranged a breakfast run at Alton Water on the 3rd, May, today is your last chance to get those orders in so please contact Luke, Claire, Ade, Graham or Karen if you haven’t already, On Friday 8th May we have a Track session booked 7:30pm at Ipswich, unfortunately I’m unable to make either of these events but I see many of you are so I wish you all a great time. Rodgers trail run’s return on the 17th May, this time at Friday Woods, so please continue to support Rodger, he puts a lot of work into them, and we all know just how much time and effort he already puts into the club for our benefit, so let’s have a bumper crowd to show just how much we love him. On the 20th May is Micky Edwards heat 2, so please join us for a fast 5k, or if you can help out to marshal to allow others who may wish to run then please just drop me an email. My best wishes to those of you running Milton Keynes and Halstead Marathon this month, we have a Bentley water station for Halstead so if you can help or just want to support then contact Paul C or Vicky. The facts: 7 marathons in 7 days, that’s 183.4 miles, completed in 32 hours and 52 min’s, at an average of 4 hours and 38 min’s per marathon, and just over 10 minutes per mile. Now consider Shawn has a pb of 3:48 and you begin to realise the magnitude of he’s effort, throughout he’s challenge a number of you joined him and became inspired by him, Graeme Semple ran 18 on day 1, Jamie after a pb effort in Manchester ran 17 with Paul Hollidge 19 on day 2, and then to top it off Phil Presland, having never gone beyond 14 ran 26.2 on day 6 now that really blew me away! 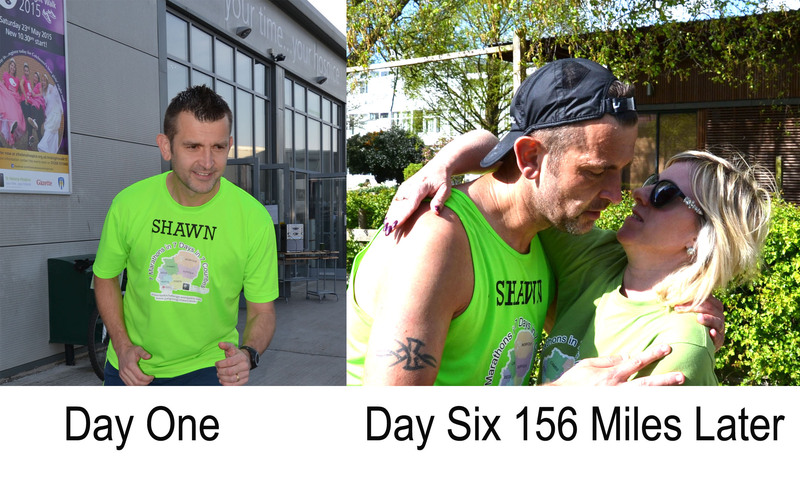 With support runs from Mark Ross, John Bush, Russ, Karen, Janine, Linzi and Vicky and the amazing support crew of Graham Miller and Eric Shaw who made this a reality for Shawn to achieve. I had the pleasure of running with him in Cambridge and I witnessed firsthand just how strong and determined he was to get the job done in he’s quest to raise as much money as possible for St Helena Hospice. Shawn you inspired so many including myself, and with the heart of a lion you pushed yourself day in day out, your focus and determination was immense and you are living proof, that we all can push ourselves to another level when we believe and have the desire to do so. Absolutely amazing you deserve all the plaudits you receive so don’t be shy and soak it all in! Some excellent individual performances from you all this month, please make sure you give your body time to rest and recover before gradually easing back into those harder sessions, with the added benefit of endurance from Marathon’s you can now go on to increase speed and enjoy personal bests in the shorter distances coming up. It’s always a tough call to pick a runner of the month, but this guy with what he’s achieved has made it a little easier, so congratulation’s to Shawn Leek ROM for April.